Features 50 activities that can be used in the workplace during staff meetings, as a part of training sessions, or even in the course of daily work. This book lays out the structure of circle conversation, based on the original work of the co-authors who have studied and standardized the essential elements that constitute circle practice. It takes readers through a circle visual (the Components of Circle) and presents both structure and story so that readers understand how these elements come into play and how they interrelate and interact. It also embeds circle process experience in stories and examples drawing on the authors' 15 years of experience as global thought leaders and originators of this form, and it presents detailed instructions and suggestions for getting started, setting goals, and solving conflicts. Meetings in the round have become the preferred tool for moving individual commitment into group action. In his best-selling book, "Squirrel Inc.," former World Bank executive and master storyteller Stephen Denning used a tale to show "why" storytelling is a critical skill for leaders. Now, in this hands-on guide, Denning explains "how" you can learn to tell the right story at the right time. Whoever you are in the organization CEO, middle management, or someone on the front lines you can lead by using stories to effect change. Filled with myriad examples, "A Leader� s Guide to Storytelling" shows how storytelling is one of the few available ways to handle the principal and most difficult challenges of leadership: sparking action, getting people to work together, and leading people into the future. The right kind of story at the right time, can make an organization � stunningly vulnerable� to a new idea. This book provides trainers with a wide range of activities to help teach and apply the most critical leadership competencies participants need, enabling you to develop and liberate the leadership qualities learners already have within themselves. It is a unique collection of proven exercises that will elicit the best from those who wish to lead. By helping you explore why you came into the job in the first place and how to use that moral purpose to drive school improvement, the author has written the essential read for principals who know that there is more to school improvement than blindly following government initiatives. Gives the confidence to do those things that principals know are right for the children, right for the staff and right for the community. Now in its third edition, this comprehensive and endlessly practical guide includes a new chapter on couples communication and new information on using validation strategies during conflicts. Other topics include active listening, reading body language, and public speaking. This is a comprehensive handbook provides essential research, theoretical framing, and practical guidance to help higher education practitioners develop, advance, and sustain a student leadership program. 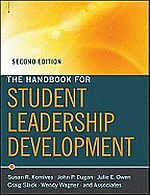 This new and thoroughly revised edition introduces a model for designing and executing any student leadership program, which will serve as a framing device for the book. This model covers: Foundations of Leadership Education, Program Design, Program Context, and Program Delivery. In addition, the book includes a rich, organized array of further recommended resources that will be connected to elements in various chapters. The chapters contributed to this book have been written by the staff and associates of The Tavistock Consultancy Service, whose distinctive competence is in the human dimension of enterprise and the dynamics of the workplace. From their own perspectives, they tell a story of the experience of working as consultants over the decade with individuals, teams and whole organizations. The intention is to identify and explore some of the key themes that have emerged and how these affect and influence the understanding of leadership and management in contemporary organizations. In this revealing study, Larry Hirschhorn examines the rituals, or social defenses, organizations develop to cope with change.